There's no tactile feedback. That little metal plunger creaks in and out, or the big silver dome eases into the box, but neither ever really "snaps" or "pops" so that you feel that the button has been pressed. There's no audio feedback. Often this comes along with the tactile feedback, where a button snap is both felt and heard. But sometimes the audio is added artificially - iPod touch wheel controls add that clicking sound when scrolling, making otherwise bland touch controls very satisfying. There's no immediate effect. This is just the nature of crosswalks; you don't press a button for an immediate result, but rather to place a request that will be fulfilled later. In situations like this, the indicator mentioned in the previous item is especially worthwhile! So there we have it: one little button, four ways it's failed us. It may seem trivial, but consider the stakes. 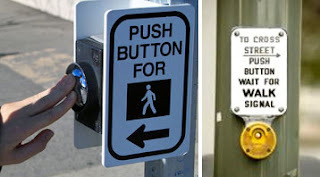 How many people have thought the button must be broken due to lack of any kind of feedback, and decided to cross the street without the "walk" sign...? I've used some crosswalk buttons that beep when they're pushed. It doesn't really help because they beep and then... nothing. Usually, the light still goes through the full cycle before the crosswalk sign gives the go, which makes me wonder if the buttons are there for anything other than to placate people who are supposed to wait to cross the street. I like the idea of a button that lights up. I also like the crosswalk signs that countdown to let you know how much time is left. Actually, it turns out that Rafael's right - at least if he were in New York City! The New York Times reports that the buttons have been inoperative since the intersections became computer-controlled looong ago. But the buttons are still there, as are the signs instructing people how they "work," and people keep on pressing. Which brings up the idea of fake products; can the illusion of control make people behave in some desirable way, or feel happier by believing they have some control? Crazy stuff! In my town there's a few intersections with motion sensing crosswalk "buttons." you just wave your hand in front of it, and half a dozen red leds light up when it sees your hand. Ryan, thanks for writing - sounds like we should all move to your town! That's exactly the kind of feedback crosswalk buttons need! I had a problem with this on a school field trip recently. We pushed the button. Several times. The light never changed. We waited through at least five cycles before deciding to cross on a red light. Yikes, definitely sounds like a safety concern if the button is so non-responsive that you give up and cross on a red light! It just highlights the importance of even the smallest design decisions. Thanks for the comment!